After clearing their head during the All-Star break, the Rockets won in impressive fashion over New Jersey 114-88 at Toyota Center Tuesday night, showing again that without McGrady in the lineup, they are a tougher team to beat. The numbers don’t lie. The Rockets are now 13-6 without him around. More to come about the game after our daily drama report about McGrady. Yao prepares to throw down a vicious one-handed dunk over fellow countryman Yi Jianlian. Yao would lead all Rockets in scoring with 20 points. Click here for more game photos. It was reported by ESPN late Tuesday night that McGrady said he would have to get season-ending microfracture surgery on his left knee. This is after all of the confusing messages that have been coming from him over the past few weeks, but with Rocket doctors still holding firm that nothing is structurally wrong with his knee. Someone isn’t telling the truth. You can probably guess who isn’t, but I guess we’ll all find out soon as more tests are conducted over the next couple of days. I’m thinking there has been a big delay in everyone understanding the real story because 1) the Rockets aren’t really motivated to have McGrady play because they are playing well without him, 2) McGrady is a nut so why embarrass him, and 3) the Rockets’ annual Tux & Tennies Gala is Wednesday night, and if the Rockets made a major announcement before the event, it might taint the entire evening, and maybe even make some big-time contributors unhappy that they can’t sit next to the players they were expecting to see. So if a big trade happens, expect to hear about it on Thursday after Tux & Tennies. I won’t get into the timeline of what has been said by McGrady over the past few weeks that has made this whole drama such a cluster. I’d be writing about it forever. You probably already know most of it, so no need to report it. Dikembe Mutombo goes up for a one-handed jam after a Tracy McGrady dish for his only points of the game against the New Jersey Nets. 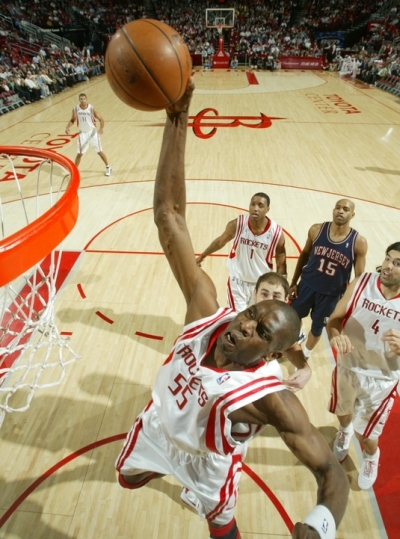 Mutombo also had 5 blocks to contribute to the Rockets holding the Nets to 30% shooting in a 91-73 victory. Click here for more photos from the game. The Rockets are winning so many different ways these days. Either through balanced scoring, one guy taking over (like McGrady’s 41 Saturday night), or when the shooting isn’t spectacular, using smothering defense to win without the fireworks. The Rockets ‘only’ shot 46% from the field Monday night, but their defense was incredible against the New Jersey Nets, who only scored 28 points in the first half on 16% shooting and trailed by 18 points at halftime. The Nets would cut the deficit to 14 points in the third quarter, but the Rockets turned up the intensity and led by 27 before playing the rest of the game with second- and third- team guys, coasting to a 91-73 victory and winning their 19th in a row. It was also their 10th in a row by double-digits, tying an NBA record. It’s incredible that the 5 Net starters of Richard Jefferson, Vince Carter, Nenad Krstic, Devin Harris and Josh Boone scored only 41 points for the game. I guess they haven’t been watching much video of Mount Mutombo lately. Who says Yao can’t jump? Here, Yao jumps to defend against New Jersey’s Vince Carter as he drives to the basket and misses a wild shot. Yao also did some damage on the offensive end of the court, scoring 25 points, grabbing 11 rebounds, dishing 5 assists, and blocking 3 shots in a fairly easy victory over the struggling Nets. Click here for more photos from the game. After so many games against tough opponents — the toughest schedule in the league — the Rockets are finally able to get a “break,” play against weaker opponents (like Memphis on Wednesday), work on their chemistry, and get other guys involved in their new offense. That’s what happened again Friday night in New Jersey as the Rockets easily beat the Nets 96-89, and four Rockets scored in double-digits: Yao Ming (25), Tracy McGrady (24), Rafer Alston (15), and Shane Battier (12). The Nets could never get anything going as the Rockets held double-digit leads most of the game. That has been par for the course for the Nets at home this season, where they have had double-digit deficits in their last 9 home games, and have trailed at halftime in 15 of their 19 games. The Rockets kept that trend going through halftime Friday night by leading 48-33 after shooting 54% as a team. McGrady was feelin’ it in the first half. He got hot and the Rockets kept feeding him as he scored 19 points on 7-of-10 shooting in the first half, hitting fallaways and tough shots, including two three-pointers in a row. By halftime, Yao had 10 points on 3-of-7 shooting, easily being able to shoot over Jason Collins , Jamaal Magliore, and other defenders. No one had an answer for him. I loved one play at the 8:55 mark in the first quarter after Yao chased down a ball from the high post, dribbled a couple of times toward the basket, then threw a perfect pass to Chuck Hayes for a layup. What mobility in the high post — I love it! Yao battled New Jersey’s Jason Collins Friday night with two fingers wrapped together because of his middle finger being dislocated Wednesday night in the Boston game. The tape on his fingers didn’t inhibit Yao at all since he scored 24 points, made 6-of-11 shots, hit 12-of-13 free throws, and grabbed 13 boards in 30 minutes for the Rockets’ second convincing win in a row. Meanwhile, Collins scored 0 points and grabbed two boards in 12 minutes of play. Click here, here and here for more photos from the game. The dismal games the Rockets played right before Yao Ming came back from his injury are quickly becoming a distant memory. They put the ‘pedal to the metal’ late in the third quarter and early in the fourth on a 15-0 run to put away the pesky New Jersey Nets, cruising to a 112-91 win. That’s two games in row where the Rockets have scored 111 points or more (they had 111 against Boston Wednesday night). Yao is starting to hit his stride very quickly, having his best game since coming back 3 games ago. In just 30 minutes of play, Yao scored 24 points (6-of-11 shooting) and grabbed 13 boards. And let’s not forget about that wonderful free throw shooting stroke, the not-much-talked-about part of his game. He was 12-of-13 from the line. Those numbers just send chills down my spine. What a weapon. It’s hard to believe that one player like Yao can increase the Rockets’ scoring average so much, even when he’s playing only 30 minutes a game. But that’s what is happening as Yao makes things so much easier for everyone, including Tracy McGrady. T-Mac scored 34 points in 34 minutes, dished 5 dimes, and he’s loving Yao’s return back in the lineup. But just like the minor injury Yao had with his dislocated middle finger in Boston, he experienced another minor injury Friday night. This time to his thigh. Yao did come back into the game in the fourth quarter, really just to get more conditioning since the game was very much under control. You gotta love the Big Guy. He could have easily sat out and taken the rest of the evening off, but he’s looking to take advantage of game situations and get his reps in. Great example of why he’s considered one of the hardest working guys in the NBA. The Rocket who is under the radar and starting to impress me again is Chuck Hayes. Clearly being the beneficiary of Yao and T-Mac being in the lineup, he scored 11 points on 4-of-6 shots, with some of those buckets coming on beautiful, athletic plays in the paint! What has gotten into this guy? He’s suddenly becoming an offensive force. He also grabbed 7 boards. Luther Head (10 points) and Rafer Alston (12 points) are also benefiting from Yao’s presence down low. Alston hit 4-of-9 three-pointers, and Head made 2-of-3 treys. Finally, with these past two blowout wins, guys at the end of the bench like John Lucas, Steve Novak, Billy Spanoulis, and Jake Tsakalidas are getting a few minutes of playing time. Funny how one guy can make such a difference. You don’t hear much about the Rockets not needing Yao now. Just when you think the Rockets are doomed for another season because of injuries and Yao being out with a fractured leg, they get a huge 25-point 96-71 win against the Nets in New Jersey on the second game of a back-to-back. T-Mac struggled (17 points only 4-for-16 shooting, 5 turnovers) for the second straight game since coming back from his back spasms Tuesday night, but Shane Battier reminded everyone of the professional he is, picking up the scoring load and scoring 23 points on an amazing 7-of-12 three-point shooting night, along with 9 boards. What’s also incredible is that the Rockets won by such a big margin while committing 24 turnovers and Luther Head scoring only 6 points. Obviously, the defense was the key to this victory, holding New Jersey to only 33% shooting and outrebounding the Nets 54-32. I had said a few posts ago that the Rockets’ defense will always keep them in games, and it did the job again this time against the Nets. Yao shoots over New Jersey’s Nenad Krstic on his way to scoring 36 points and grabbing 9 boards. 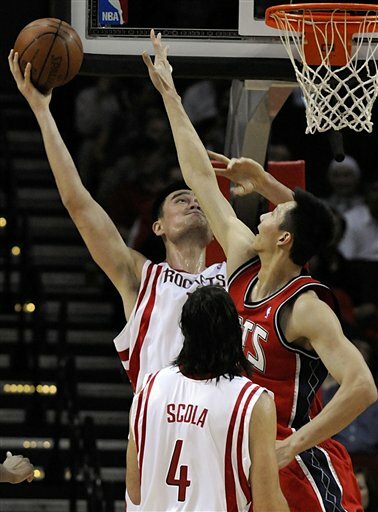 But several of Yao’s teammates shot poorly, leading to a disappointing loss, 90-77. Click here for more photos from the game. MONDAY, 3/13/06 – Behind three games in the standings for the eighth and final playoff spot in the Western Conference with only 19 games to play, the Rockets could not afford to lose to the Nets on Monday night. Although the Nets are good, they are beatable since the Rockets had beaten them 3 games in a row. Second, it was a home game for Houston at Toyota Center. Earlier in the season that didn’t mean much, but lately they have won their last 3 games at home. 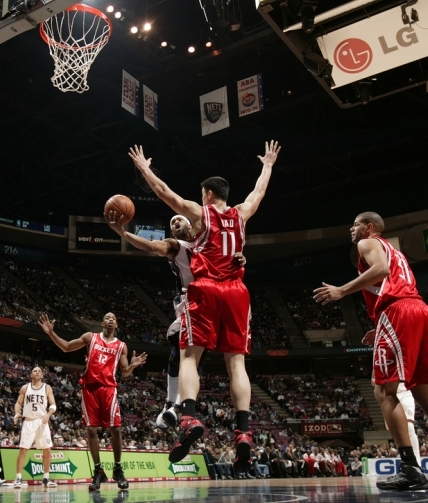 Yao put his team on his back, scoring 36 points, making 18-of-20 free throws, and grabbing 9 boards. But without T-Mac and David Wesley in the lineup, the Rockets had to rely on Yao’s supporting cast to shoot decently. They didn’t. The Nets ended up with an easy victory, winning 90-77, and IMHO virtually dooming Houston’s chances of making the playoffs. They are now 3.5 games behind with 18 to play, but they still have to play Dallas, San Antonio, the Clippers, and Dallas again over their next four games. This report is going to be very short because of work deadlines I’m facing this week. In fact, my reports all week will probably be short because of my work duties, and if the Rockets continue to lose as the season winds down. It’s kind of depressing to write much about a game where the Rockets’ role players shoot awful while the season slips away before our eyes. T-Mac comes up big in first game off injured list — breaks 3-game losing streak in N.J.
Yao shows his speed in trying to defend New Jersey’s Richard Jefferson on Saturday night in New Jersey. Although Yao scored 18 points on 5-of-7 shooting, T-Mac was the star of the game, miraculously scoring 35 points, grabbing 10 boards, dishing 4 assists, and blocking 3 shots in his first game off the injured list. For more photos from the game, click here. SATURDAY, 11/12/05 – Tonight’s game between Houston and New Jersey had to be one of the greatest games of a player coming off the injured list seen in recent NBA history. We were all pleased to see Tracy McGrady get back into the starting lineup tonight, about two weeks ahead of schedule. No one could fault him for shooting 1-for-9 in the first half and scoring only 5 points. As of Thursday, the dude wasn’t even expected to play for a couple more weeks. He was going to be rusty. He’s human. At least in the first half he was contributing with 6 rebounds, 3 assists, a steal, and a block. But in the third quarter he showed he is more than human by warming up and hitting 5-of-8 for 10 points. Then when the Rockets needed him in the fourth quarter, T-Mac stepped up and scored 20 points on 7-of-9 shooting and 4-of-4 from three-point territory! Result? The Rockets broke their three-game losing streak and won on the road in New Jersey, 99-91. I typically would claim a performance like T-Mac’s on Saturday night had to be one of the most amazing second halves played by a Rocket player in years. But when you’re talking about T-Mac, it really isn’t. On March 28th of this year, T-Mac scored 22 points in the fourth quarter to pull out a win in Utah. You are currently browsing the archives for the vs. New Jersey category.